A chickens' body temperature normally runs at 102-103 degrees F.
A rooster takes 18-20 breaths a minute, a hen 30-35. There are over 150 varieties of domestic chickens. Chickens are not capable of sustained flight. It takes a hen 24-26 hours to lay an egg. The latin name for chicken is Gallus Domesticus. Chickens come in an infinite variety of colors and patterns. Chickens lay different colored eggs, from white, to brown, to green, to pink, to blue. A chicken can have 4 or 5 toes on each foot. Grocery store chickens are 5-8 weeks old. Chickens were domesticated about 8000 years ago. Americans consume 8 billion chickens a year. All domestic chickens can be genetically traced to Gallus Gallus, The Red Jungle Fowl. It takes 4 lbs.+ of feed to make 1 dozen eggs. The chicken was once considered a sacred animal symbolizing the sun. Breeds were developed to provide plumage for ceremonial costumes. The first Poultry Exhibition was held in the United States on November 14, 1849. There were 219 exhibitors, 1023 birds, and over 10,000 visitors. One trait, called Melanosis, causes chickens' bones, ligaments, skin and tendons to be colored BLACK. In 1925, hens laid an average of 100 eggs a year. In 1979, the World Record was set by a White Leghorn who laid 371 eggs in 364 days!!! 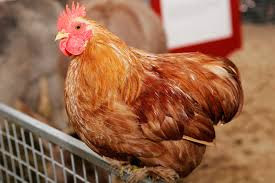 A hen lives an average of 5-7 years, but can live up to 20 years. She'll lay eggs her entire life, with production decreasing every year from year one. An egg starts growing into a chick when it reaches a temperature of 86 degrees F.